For some of us, turning 17 meant ditching class, hanging out with friends and seeing just how much we could get away with without your parents taking away your car keys – if you were so lucky. 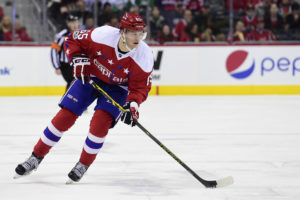 But for André Burakovsky, turning 17 came with the decision to leave his hometown of Malmö for a career with the Washington Capitals in the National Hockey League. 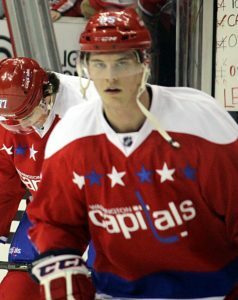 Austrian-born and raised in Sweden, Burakovsky comes from a long line of hockey players, learning to skate on ice before some kids decide to walk. His hard work and love for the sport has paid off: After playing two seasons with the Malmö Seahawks in the lower leagues of the Sweden Hockey League, he was drafted by Washington in the first round of the 2013 NHL draft (23rd overall). In Washington, he has skated alongside fellow Swedes Nicklas Backstrom and Marcus Johansson on what Capitals coach Barry Trotz has dubbed the “Tre Kronor Line,” a nod to Sweden’s national hockey team. 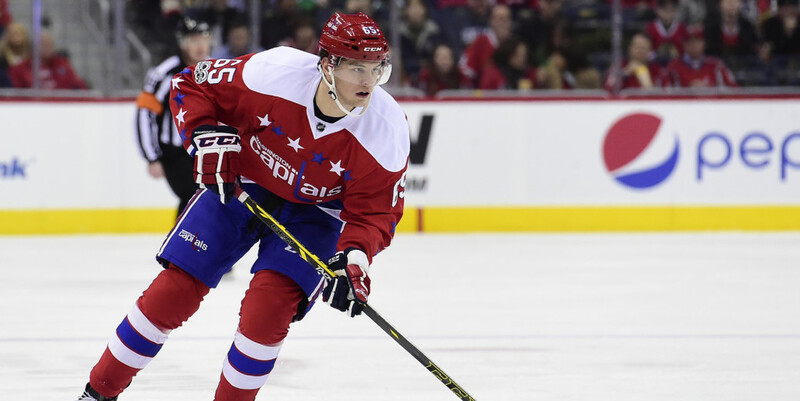 Fresh off his 22nd birthday, we caught up with Burakovsky to see what it’s like playing hockey in the United States with and against some of the greatest players of all time. Your grandfather, father and brother all played hockey. It’s probably a no-brainer, but how did you get into the sport, and when was the first time you hit the ice? I started to play hockey because of my dad, my grandpa and my dad’s brother, my uncle. Where I grew up, I watched my dad play all the time, my dad took me out on the frozen lake. Probably when I was 2 years old, I think, I was just starting to walk. As soon as I started to walk, my dad gave me a pair of skates and kind of forced me to get out and skate. You were born in Austria, but grew up in Sweden. What are some of your memories about growing up in Sweden and your growth in hockey? Any role models in hockey growing up? I have been playing hockey all my life, I have been watching hockey every day. I would follow my dad to the rink every day and skate with all the boys and had a good time. When I grew up, I was always looking up to Peter Forsberg, I thought he was an awesome hockey player – fun to watch, very physical, had a lot of skill and scored a lot of goals. You were drafted into the NHL at 17. Was it difficult to leave Malmö and your family behind and come to the States? Yeah, that was a really tough decision. That was a decision if I was going to stay in Malmö and play there or go over and play here. It was really tough, but obviously I made the right decision. The Caps wanted me to come over and learn hockey on the small ice, so that’s what I did and I thought it was the best chance for me to reach the NHL. Sophia Jurksztowicz of SportsNet Canada said that you’re the glue that holds the team together, and teammates describe you as being a happy guy. The Sports Network also dubbed you Most Popular Person (MPP) on the team. That’s got to feel pretty good, right? How would you describe yourself, both on and off the ice? I don’t know if I’m the most popular player, or the glue holding this team together, but I’m always coming into the rink with a smile on. I don’t really like to be grumpy at all, I like to have fun – life is too short to be boring or not have a good time. So, I’m just coming in trying to have fun every day and make the day the best day ever. How do you get in the zone before a game? Any superstitions? Yeah, I have a lot of superstitions. It starts when I’m waking up in the morning and continues until the game is over. In addition to your time with the Capitals, you also play for the Swedish National team. What’s the difference playing Stateside versus playing to a hometown crowd in Sweden? This [the NHL] is the best league in the world, the atmosphere in every game, the lifestyle and everything is just so professional here. It was cool to play at home, too, when you have all your friends growing up around you and all that, but obviously when you’re coming over here, you make new friends and you get a new family in your team. I love it here. What do you remember about your first NHL goal? And what about scoring two goals in the 2015 playoffs vs. the Rangers? Would either of those be the top moment in your career so far? Yeah, I would say so. Scoring my first goal, I wasn’t really expecting a whole lot of myself coming into the first game. I was just really happy to be in the NHL and to have made a team. When [Troy] Brouwer gave me that pass and I saw the puck went in, it felt really, really good. It was a dream come true. Obviously, I’ve always been looking out for [Rangers goalie] Henrik Lundqvist. And scoring two goals in a playoff game, so we won 2-1, that was pretty cool, too. Definitely the two best memories. The Caps recently have been close to the Stanley Cup Finals and lead the division again. How can the past few years help this team in getting over the hump? We’ve been close two years in a row. I don’t know how it was the year before that, but two years in a row now that we’ve been really, really successful during the regular season. When it came to the playoff, we didn’t really do what everyone was expecting. Now we have a little bit more experience, we have a really good team, we have a really good thing going on. I think we kind of know what we need to change when the playoff comes, and I think we’re going to be ready. Alex Ovechkin was just named as one of the NHL’s Top 100 players of all time. What is it like to play with one of hockey’s all-time greats? What impresses you the most about him? It’s cool. You’ll always be looking up to him, too, he’s one of the best players in the world. He’s going to be a Hall of Famer. When I grew up watching him on YouTube and then to be on the same team as him, it’s pretty cool. I have a lot of friends back home that really like him, too, so it’s cool to be around him. When you’re not on the ice, how do you like to spend your time? Usually I’m just hanging around at home. Me and Tom [Wilson] usually do a couple of things together, go out for coffee, or sit at home facing each other in Madden or whatever PlayStation game we can find. I spend a lot of time with him. Other than that, I’m just hanging around at home making food or going shopping.